Rome is packed with people! Buses are pouring in from every direction. I think the educated estimate is there will be 2 million people here for the canonization on Sunday. Our group arrived this morning and everyone is in good spirits and excited. We had a great start for the day with Mass at St. Mary Major, time for shopping around St. Peter’s Square, settling into our gorgeous five-star hotel and a marvelous Italian dinner. Everyone is now in bed catching up on their much-needed sleep. Tomorrow morning we start with Mass in St. Peter’s Basilica in the crypt of the Popes at the bones of St. Peter. Everyone is very excited about the special Mass to begin the pilgrimage. Then we will tour all of ancient Rome and including the Coliseum, Roman Forum and some of our favorite ancient churches. 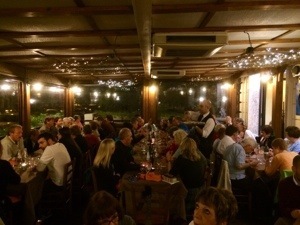 This is a picture of everyone having dinner tonight. 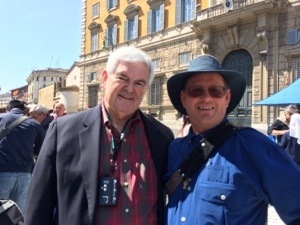 Also some of our pilgrims got to chat with Newt Gingrich at St. Peter’s where he is shooting a movie about JPII. Kind of wish I was there! Only say that because I was at the Beatification and it was a major endurance event but exciting! Hope some make it into St. Peter’s square for the Canonization. Keep us posted.